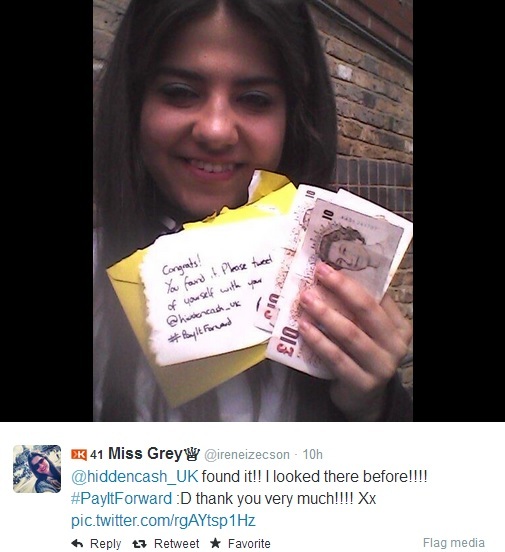 A social experiment has gone viral over the last few days here in the UK, where a mysterious mystery benefactor is using the Twitter account @hiddencash_UK and tweeting clues to help their followers find envelopes filled with a £50 prize in cash. @hiddencash_UK simply tweets photos of the locations where the envelopes are posted along with the clue and the first to reach the hiding place wins. The winners are then encouraged to tweet a picture of themselves with their loot. As the Twitter hunt for hidden cash reaches the UK, the response has been phenomenal with over 33,000 followers on Saturday afternoon but as media coverage increased a new influx of followers seemed to cause the Twitter spam filters to suspend the account. This can be filed under the ‘lessons learned’ section of the social experiment, but it should also leave the people at Twitter with red faces but at around 18:20 the account was reinstated with over 36,000 followers and an increased curiosity about this stranger hiding envelopes of cash. I wonder how long it will be before you see that cringe worthy advert on a newspaper saying “Do you know the identity of @hiddencash_UK? Call us now” Before others try and spoil the magic behind this pay it forward style treasure hunt, maybe we should all just soak up people performing selfless acts to help others all over the world. The idea started in San Francisco last week but quickly spread across other states in America before going global only a few later and there are other accounts performing the same treasure hunt in Nigeria, India, Hong Kong, the Netherlands and now the UK. The first £50 drop began in Leeds but it wasn’t long before Twitter followers in Manchester, Sheffield and Brighton enjoyed a piece of the act prompting BBC 5 Live, Sky News and UK newspapers to spread the word, so its only a matter of time before the inevitable media frenzy ensues. 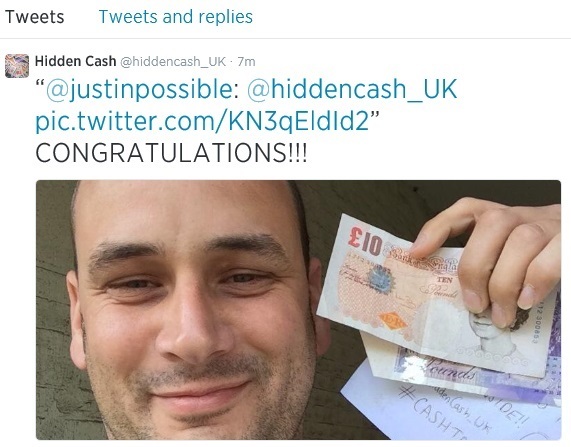 The anonymous creator has told the media, that his cash giveaways are a “social experiment for good” and the only details are that the person behind @hiddencash_UK is a 25-year-old male, who made his money though several e-commerce businesses, and added that up to £200 could be stashed in the capital’s drop on Sunday according to the Daily Telegraph. “I had seen the version in the US and thought it was a really great idea. I thought why not bring that over here and the reaction has been really good. “I’m in a fortunate position to be able to give away money on a daily basis at the moment. I have had a few businesses in e-commerce that have done really well for me. “It got to a point where there is only so much stuff that money can buy and for myself – as well as for the people finding the money – I find it quite fun. He added a team of eight people around the UK would continue to orchestrate the next week as he travels abroad for international business meetings. “I have to travel abroad but I’ve called on a group of people to keep it going for me. It will be a little more infrequent but I don’t have any plans to stop. “There isn’t a limit on how much I’m going to give away. As long as there’s interest in it, I’ll keep doing it. Before the trolls get their pitchforks and torches ready to twist this story or cause a backlash as everyone begins to over analyse a social experiment in order to give it some deeper meaning, wouldn’t it be nice if we could all just accept that someone who has accumulated more than he actually needs as decided to have a little fun and help other people out along the way. When something like this is spreading across the world, it should restore our faith in humanity and people adopting a ‘Pay it Forward’ kind of ethos is something we should celebrate rather than through the cynical view that some in the media would like us to all to have. The cynical are struggling to comprehend the concept of a selfless act, which is both fascinating and disappointing to see, but equally fantastic that more and more people “paying it forward” to silence those trying to create a backlash. The Twitter account now has over 60,000 followers and is growing rapidly as people subscribe to the idea and yes there was another lucky winner today who collected an envelope of £50 in cash as the give-away reached London. On the other side of the Atlantic in the in the Californian Sun, chaotic scenes hit the beaches as @HiddenCash announced that he had stuffed cash into 36 plastic models of red Angry Birds and buried them ankle-deep in the sand at Hermosa Beach, “between the pier and the volleyball nets”. Over here in the UK, our very own version of this social experiment @hiddencash_UK announced another impending cash drop was going to be placed in the slightly less glamorous Peterborough. @justinpossible arrived on the scene of the latest hidden cash drop in Peterborough and walked away with an envelope of cash. ← News Reader Apps: How Do You Consume Your News?